On Tuesday, the CACI Governmental Affairs Council voted to support the package of five telecommunications bills that seeks to modernize the state’s telecommunications laws because of changing technology. The package passed the House Wednesday on final, Third Reading with bipartisan support. The package now moves to the Senate. The lead House sponsor of the package is Representative Angela Williams (D-Denver), chair of the House Business, Labor, Economic and Workforce Committee. Representative Carole Murray (R-Castle Rock) signed on as a c-sponsor for three of the bills, and Representative Don Coram (R-Montrose) as a co-sponsor for one bill. HB-1331, which involves the regulation of local-exchange services as it impacts competition. The House Finance Committee withdrew the sales-tax exemption component of this bill through the amendment process. The plan is to re-insert this sales-tax exemption during Senate consideration. Approves deployment of broadband to unserved areas through grants, where “unserved” is tied to the FCC federal standard: Currently at 4Mbps “down” or downloading and 1 Mbps uploading. Prime Sponsors: Reps. Williams and Coram, Sens. Nicholson and Crowder; Other sponsors: Reps. Becker, Dore, Hamner, McLachlan, Mitsch Bush, Scott & Tyler; Sen. Schwartz. “Despite AARP opposition, House passes telecommunications bills,” by Anthony Cotton, The Denver Post, April 9th. “Telecommunications reform package moves to Colorado Senate after House approval,” by Ed Sealover, The Denver Business Journal, April 9th. For more information on the telecommunications package, contact Loren Furman, CACI Senior Vice President, State and Federal Relations, at 303.866.9642. The House prime co-sponsors are Speaker Mark Ferrandino (D-Denver) and Minority Leader Brian DelGrosso (R-Loveland). Representative DelGrosso also is a member of the Finance Committee. “This is a great bill,” the Speaker told the House members just before the Third reading vote. The proposal creates a sales-and-use tax exemption for “qualified property” used in space flight. The qualified property includes space vehicles and components, equipment to be placed in a space vehicle and fuel for space flight. The bill contains a five-year “sunset” provision. The bill’s fiscal note says that the State will lose $74,327 in the current fiscal year ending June 30th and $77,895 in the following fiscal year. For more details on the CACI-initiated bill, see the February 14th article in CACI’s The Colorado Capitol Report. The bill has been scheduled for its first hearing in the Senate Finance Committee for Thursday morning, April 17th, in Senate Committee Room 354 after the Senate adjourns its Floor Session. The Senate co-sponsors are Senator Mary Hodge (D-Brighton), chair of the Senate Appropriations Committee, and Senator Kevin Grantham (R-Canon City). The recorded vote was largely bipartisan, with 58 Democrats and Republicans voting for it. Nonetheless, six Republican representatives voted against the bill: Perry Buck (Windsor), Justin Everett (Littleton), Stephen Humphrey (Windsor), Dan Nordberg (Colorado Springs) Lori Saine (Firestone) and Jared Wright (Fruita). Representative Frank McNulty (R-Highlands Ranch) was excused. The bill passed the House Finance Committee on February 13th and had languished in the House Appropriations Committee for almost two months before it was approved on Tuesday. On that day, the bill was then approved by the full House on Second Reading. For more information on HB-1178, contact Loren Furman, CACI Senior Vice President, State and Federal Relations, at 303.866.9642. “Colorado lawmakers pass on PERA,” opinion, by Vincent Carroll, The Denver Post, April 11th. “Bill to add $100 million to Colorado new road funding crashes,” by Ed Sealover, The Denver Business Journal, April 11th. “Colorado tourism-incentive limits advance, despite concerns of funding board,” by Ed Sealover, The Denver Business Journal, April 10th. “Third version of higher-ed makeover passes committee,” by Todd Engdahl, Chalkbeat Colorado, April 9th. “Governor Hickenlooper’s staffing overhaul, sold as cost-neutral, costs millions,” by Arthur Kane, The Denver Post, April 9th. “Colorado sought waivers from residency rules to fill high-paying jobs,” by Arthur Kane, The Denver Post, April 9th. “Hickenlooper’s staff delayed records access for at-will hires story,” by Arthur Kane, The Denver Post, April 9th. “Proposed Colorado business personal property tax cut is slimmed down again,” by Ed Sealover, The Denver Business Journal, April 8th. “Colorado’s spending transparency improves this year,” by Heather Draper, The Denver Business Journal, April 8th. “Higher-ed funding bill sparks high level differences,” by Todd Engdahl, Chalkbeat Colorado, April 7th. “Senate okays budget bill, now for the conference committee,” by Peter Marcus, The Colorado Statesman, April 7th. “Legal pot becomes a touchy workplace issue,” by Trevor Hughes, USA Today, April 7th. “Colorado highway funding pie pits urban against rural interests,” by Garrison Wells, The Colorado Springs Gazette, April 7th. “Proposal to hike oil and gas fines by 1,400% returns to Colorado Legislature,” by Cathy Proctor, The Denver Business Journal, April 7th. “Colorado business groups bracing for sick-leave measure coming in Legislature,” by Ed Sealover, The Denver Business Journal, April 4th. “Colorado legislators expand recruitment tax credit but kill two other business bills,” by Ed Sealover, The Denver Business Journal, April 4th. This week CACI sent a letter to the U.S. House Energy and Power Subcommittee urging support for H.R. 6, the Domestic Prosperity & Freedom Act of 2014. H.R. 6 passed out of the subcommittee and will now be heard by the Energy and Commerce Committee. This legislation would allow the U.S. to expand Liquid Natural Gas (LNG) exports to World Trade Organizations, and not just Free Trade Agreement (FTA) nations. On behalf of the Board of Directors of the Colorado Association of Commerce & lndustry (CACI), I am writing to state that CACI supports H.R. 6, and the focus of the Domestic Prosperity and Global Freedom Act. We appreciate the House Subcommittee reviewing our letter of support and positive merits of this legislation. Businesses throughout Colorado have benefitted tremendously from the recent “shale gas revolution,” certainly one of the most important energy developments in decades. Currently, Colorado ranks 7th in the United States in natural gas production, and oil and natural gas can be found in 42 out of Colorado’s 64 counties. In terms of employment, the industry supports more than 137,000 jobs in Colorado and more than 2.8 million in the U.S., according to data provided by the Colorado Petroleum Association and Colorado Oil and Gas Association. The recent NERA report found that allowing overseas sales of LNG would further strengthen the natural gas industry and in particular, our nation’s economy. Moreover, the report also noted that for every one of the market scenarios examined, net economic benefits increased as LNG exports increased.” These valuable benefits cannot be overlooked, especially during a time of positive, but fragile economic recovery. H.R. 6 is the kind of tool we are looking for to foster growth in LNG exports. The benefits of H.R. 6 will extend far beyond Colorado, as trade balances are improved and wealth is transferred back into our country in the form of infrastructure and foreign investments. Allowing these exports will also go a long way to stabilize the exploration and production of natural gas, providing a new outlet for domestic production. By furthering trade relationships with World Trade Organization nations, and not just Free Trade Agreement (FTA) nations, we are keeping natural gas available and affordable for homes, businesses and power plants, in Colorado, throughout our nation and the world. CACI believes LNG exporting will be good for the citizens and businesses of the state of Colorado, and believe H.R. 6 is the vehicle to expand LNG exports. We respectfully urge the House Subcommittee on Energy and Power to approve H.R. 6, the Domestic Prosperity and Global Freedom Act. Representative Gardner’s Office issued a news media release after the vote, citing CACI as one of the supporters of the bill. 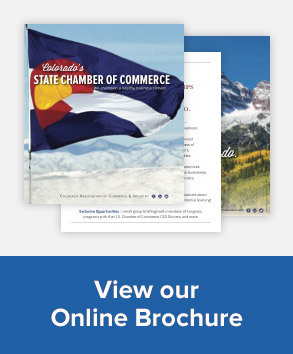 For more information on the CACI Federal Policy Program, contact Leah Curtsinger, Federal and State Governmental Affairs Representative at 303.866.9641.